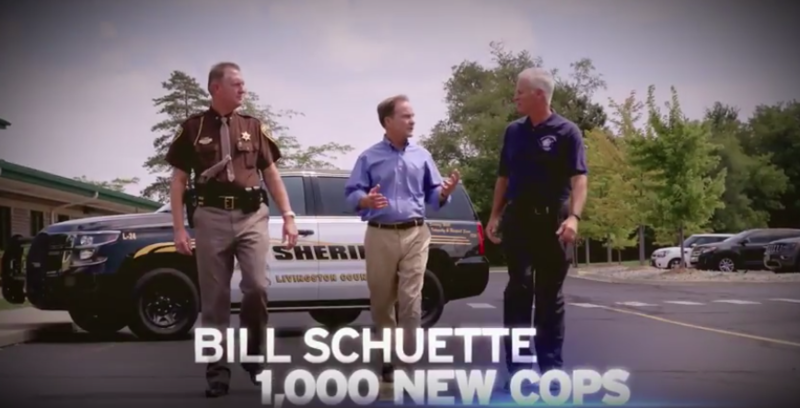 Attorney General Bill Schuette in a TV ad mentions he sought to put more cops on the beat. Whenever he can, Bill Schuette mentions his endorsement by Donald Trump. And like the president, Schuette is campaigning as a law-and-order executive in his bid for Michigan governor. That is mostly accurate, because as Michigan’s attorney general Schuette did indeed call for more police. But it’s also dated, silent on how vigorously Schuette “pushed” for extra cops and doesn’t mention that his plan didn’t go anywhere. Soon after Schuette took office in 2011, crime fears washed over Michigan. Murders spiked to their highest level in six years in 2012. Four cities ranked in the country’s most violent (Flint, Saginaw, Detroit and Pontiac). And years of budget cuts left police shortages in Detroit, the Michigan State Police and numerous other forces. That year, Schuette announced a plan to allow prosecutors to seek 25-year minimum sentences for four-time felony offenders, and divert $140 million from a $400 million state budget surplus to hire 1,000 officers in cities statewide. The sentencing reform – known as VO4 – became law. The plan for cops went nowhere. It drew some praise but also criticism because it would only guarantee state funding for two years. After that, the Legislature would have had to appropriate more money, or the burden would have fallen to local communities. In an editorial, The Saginaw News called Schuette’s plan “a bit naive” on where continued funding would come from. Since then, funding for State Police has increased, and the number of troopers has grown to 1,022 last year from less than 900 in 2012, state records show. “Schuette feels the spirit of the 1,000 new cops proposal was agreed with by the Legislature and governor, as they have concentrated on adding more state troopers every year,” John Sellek, a spokesman for Schuette’s campaign, told Truth Squad. Gov. Rick Snyder was committed to increasing trooper ranks from day one, and Schuette had nothing to do with it, countered Mike Schrimpf, spokesman for Republican gubernatorial rival Lt. Gov. Brian Calley. Schrimpf noted that Schuette’s office calendar, which the Calley campaign acquired through the Freedom of Information Act, shows no meetings between the attorney general and Snyder that are specifically identified as tied to the 1,000 cops plan. “If it was more than a sound bite, you'd think it would have warranted a meeting,” Schrimpf said. There’s no question Schuette called for 1,000 new cops. Heck, a video of the announcement is still on YouTube. But did he push for them? Now we’re getting into semantics. Like a lot of proposals that fail, there’s room to second-guess the merits of Schuette’s plan and how hard he fought for it. But campaign ads can’t include all details and serve mostly to highlight values, records and aspirations. And there’s no doubt that Schuette has a close relationship with law enforcement, winning several endorsements and sounding the alarm for more cops when Michigan needed them. Most first responders (police and fire) are local government responsibilities. Massive cuts to revenue sharing have meant huge reductions in numbers in those areas. This year, the state's revenue sharing to, say, Detroit, increased by only 0.8 percent -- less than inflation -- putting more pressure on the city's budget. If a state official wants more police, the best way to do that is to restore revenue sharing. More info at savemicity.org. Schuette will run on the trademarked Trump campaign model: Fear and Hate. Fear the hordes, aliens, crime, etc. Even when the stats say quite the opposite. But he'll love the Russians, Russian election meddling and reducing the number of voters. That's 'freedumb' according to the GOP.